Wisconsin Family Council is the educational 501(c)(3) arm of Wisconsin Family Action. Its mission is to forward Judeo-Christian principles and values in Wisconsin. 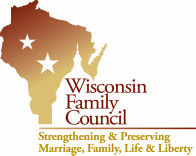 WFC largely accomplishes this mission by informing Wisconsin citizens, churches and policymakers about important pro-family legislative and cultural issues so they will be inspired to get involved in preserving and strengthening marriage and family in Wisconsin. Our vision is to help the general public and policymakers discover historical Judeo-Christian principles and traditional values. Through this we believe we can promote principles and values that will support family and public life today. t was truly an electric evening in Pewaukee on Thursday, September 24, when Wisconsin Family Council (WFC) hosted almost 200 guests at its first-ever Awards Gala, held in recognition of those in Wisconsin who are striving day in and day out to change both public policy and the culture. The two primary inaugural awards went to a Wisconsin legislator and a Wisconsin pastor. was a minister of the Gospel, and as such was the only cleric to sign the Declaration of Independence. Witherspoon supported America’s push for liberty, served in Congress during and after the Revolutionary War and had great influence on the ratification of the US Constitution. “Bob Loggans is a faithful minister of the Gospel, who understands, as did John Witherspoon, that it is altogether appropriate, indeed necessary, for pastors to be engaged in government and the critical issues of the day. In many ways, Pastor Loggans contends for the faith and challenges the culture, which is exactly what John Witherspoon did in his day,” Appling said. black robes when in their pulpits, had on the founding of our country and issued a call to action to today’s Christian community to get organized and get involved.